Israel Folau has been lambasted with hatred by the media for his beliefs. The furore over Israel Folau's stated belief, in answer to a question, that unrepentant homosexuals are destined for Hell, is remarkable for one thing and one thing only — that it is news. And big news at that. What should not surprise us is that it reminds us, if we needed reminding, that when it comes to the laws and social mores governing the denigration of people, cultures or religions, Christianity is in a class of its own. And not a good class. Clearly, Christians cannot be offended, and while they have the right to believe what they will, they do not have the right to articulate those beliefs. Those who have objected to Folau's utterance might well have a point in terms of some who do not conform to the Christian view regarding what is sexually acceptable, namely heterosexuality strictly confined within the bounds of marriage, are fragile, and therefore vulnerable. Some who take his warning to heart, we are told, might in fact be so vulnerable as to take their own lives. "It is unimaginable that a Muslim, for example, would have experienced a Folauesque reaction to any statement detailing his or her faith's belief regarding any form of human behaviour." That concern might well be genuine and realistic, but the bigger issue is his right to say what he said, and the extraordinary reaction to it. His statement has widely been described as hate speech and bigotry. It is neither. It is simply the view of a committed Christian who believes the Bible's instruction regarding how we should live. If Israel Folau was anything other than a Christian there would have been no reaction at all. It all started when Qantas, which puts a lot of money into Australian rugby, claimed that the belief that unrepentant homosexuals would be consigned to Hell did not sit comfortably with its values. Surely that has to qualify the airline for the Hypocrite of the Year award. Qantas, remember, has a formal (and no doubt highly lucrative) partnership with Emirates Airlines, based in Dubai. The United Arab Emirates does not smile particularly fondly on homosexuality, or any other form of sexual expression beyond what the Bible finds acceptable, and goes further. Indulge in any form of non-heterosexual behaviour there and you will be committing a crime punishable by fines, imprisonment, chemical castration and even execution. Foreigners who stray from the heterosexual straight and narrow are generally deported. None of that matters to Qantas, apparently. Australia's national carrier is quite happy to look the other way, but puts the frighteners on Rugby Australia when one of its star players says he believes unrepentant homosexuals will not get their reward in Heaven. Rugby Australia wasn't much better. It only took a whiff of a possibility that Qantas would withdraw its sponsorship and it turned on Folau. Whatever passes for freedom of speech and permitting minorities, of which Christianity is no doubt one, in that country was immediately kicked into touch. In this country we are now seeing rugby players add their voices to the condemnation of Folau. Brad Weber, from the lofty heights of a one-test All Black, professes to hate (a word Folau has never used) "having" to play against people who think the way he does. There's a simple solution to that. 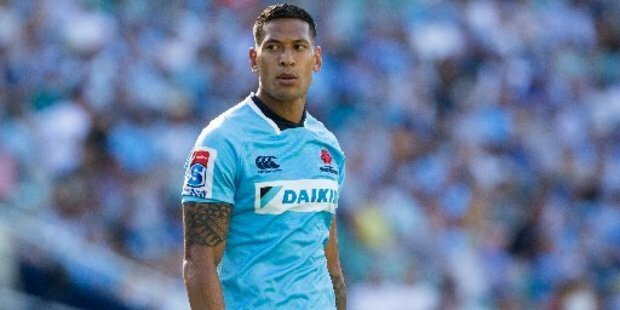 Folau has made it clear that his faith is more important to him than his career, and if needs must he will walk away from the latter in favour of the former. If Brad Weber hates the idea of meeting him on the field, he could do the same. He won't. Even Folau's wife, universally loved Silver Fern Maria (nee Tutaia), has paid a price for standing by her man. The couple have been described as a homophobic duet, which at least tells us something about the intelligence of some of the critics. Homophobia can be described as contempt, prejudice, aversion, hatred or antipathy, perhaps based on irrational fear, often related to religious beliefs. It is observable in critical and hostile behaviour such as discrimination and violence on the basis of sexual orientations that are non-heterosexual. So how does that fit the Folaus? Israel said he did not approve of the homosexual lifestyle (which he surely has every right to do), but (like all sinners) they could repent. He abhorred the sin, not the sinner, and while there might be an argument regarding whether anyone can or should repent a 'sin' that, uniquely, is not a matter of deliberate choice, that does not demonstrate contempt, prejudice, aversion, hatred or antipathy. Nor does it suggest plans to discriminate against homosexuals or offer violence to them. The question we should be asking ourselves is what reaction we would expect if such comments were made by the adherent of a faith other than Christianity. It is unimaginable that a Muslim, for example, would have experienced a Folauesque reaction to any statement detailing his or her faith's belief regarding any form of human behaviour. When Sonny Bill Williams refused to wear a jersey with a bank logo on it, because, as Muslim, he did not believe in banks (although he accepted their money, and almost certainly availed himself of their services), his stance was largely taken as mildly interesting, a bit weird perhaps, but no more. No member of any other group, however large or small, in this country would have been attacked with such vigour and vitriol as the Folaus have experienced, whatever their offence, however distasteful that offence, simply because of the degree to which society has been conditioned to respect the rights of others to speak and act as they will; ironically, not to cause offence. It is extraordinary that the same courtesy and consideration is not extended to Christianity. The perception that Christians cannot be offended, and that no one cares if they are, has been with us for a while. It was certainly alive and well in 1998, when Te Papa opened an art exhibition, for want of a better term, that included the Virgin Mary in a condom. It remained on display for six weeks, despite violent protests and counter-protests, and a number of arrests, although the exhibition attracted very little interest (and lost $118,000). But outraged protesters were unsuccessful in having the Madonna removed. One critic asked whether Te Papa would allow a sacrosanct piece of Maoridom to be mocked in such a way. We all know the answer to that. And we have yet to see Buddha in a condom. The exhibition also included a photographic depiction of the Last Supper, with a bare-breasted woman as Jesus (the work of one Sam Taylor-Johnson, better known these days as director of the cinematic masterpiece Fifty Shades of Grey. Good to know he's still contributing to civilisation. Perhaps the best riposte came from a newspaper correspondent, who wrote that the real tragedy of the Madonna in a condom was that the artist's father had not worn one. Clearly Christianity has not lost its ability to polarise, but we now know that our acceptance of cultural diversity is not so much a work in progress as a thin veneer that comes with exclusions. Israel Folau has suffered more contempt, prejudice, aversion, hatred and antipathy, critical and hostile behaviour, than he has ever directed at anyone else. So much for tolerance, a quality that his critics would say they espouse, and demand, but have no intention whatsoever of practising.